I slept in lazily this morning, getting up about 08:30, then going down to get some yoghurt to have with the last of the Grape Nuts for breakfast. I packed my luggage, making room for some of M.’s stuff that she’d left behind by leaving out my coat to wear on the plane. I searched for something to do quickly this morning before checking out, and found the Children’s Creativity Museum, just a few blocks away. This sounded good, and it opened at 10:00, letting me have a bit over an hour there before heading back to check out. I walked over through the brisk morning air, glad to have my coat on, through Yerba Buena Gardens, to the museum. It turned out to be a fairly small affair, over two storeys, and dedicated to interactive activities for kids, roughly categorised as for under 5s and over 5s. The woman who took my $12 entry fee suggested trying the animation studio, which was upstairs, so I headed there first. Stop motion animation studio at the Children’s Creativity Museum. Since the place had just opened, it was still mostly empty, and a couple of staff greeted me as the first visitor to the animation studio today. There were several tables laid out with uniformly cut lumps of multicolour streaked modelling clay, and crude wire figures of people. A guy showed me the instruction sheet, which had photos showing the process of moulding the multicoloured clay around the wire to form a figure, then getting specific coloured clay pieces from the staff to roll thin and layer over the top to create skin and clothing. At one end of the room were a few tables set up with cameras for making stop motion movies using the clay figures. 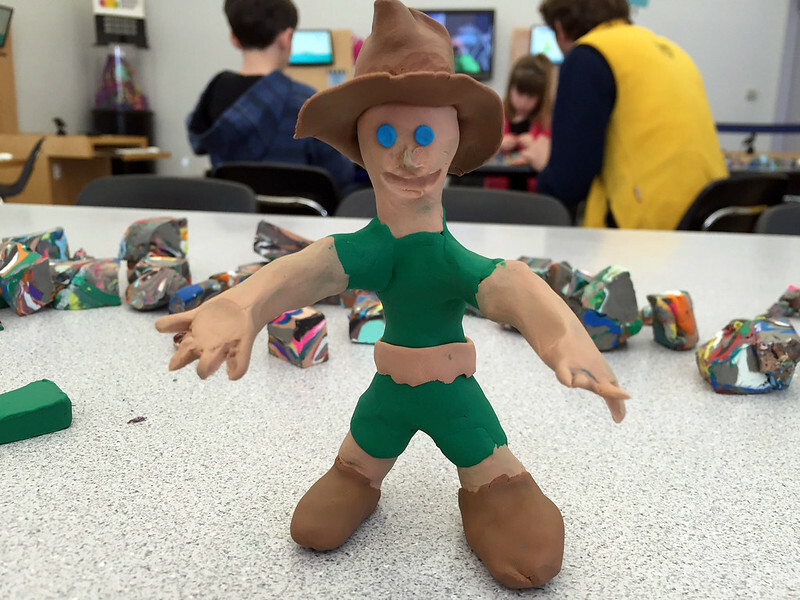 This looked fun, so I grabbed some tools and started making a human figure, then got some dark green, light brown, and dark brown clay to make a rough Steve Irwin type of figure, in khaki shorts and with a floppy hat. This took quite some time, so I passed on the animation so that I could look around the rest of the museum. 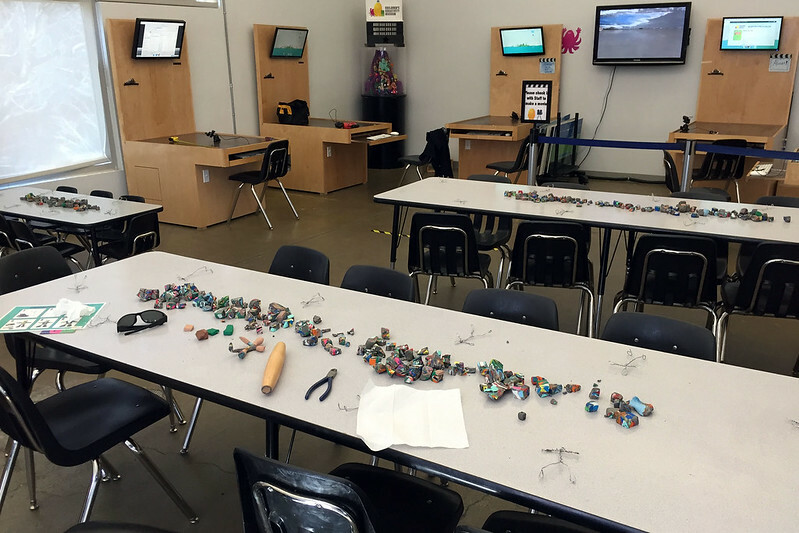 My creation, stop motion animation studio at the Children’s Creativity Museum. There was a music video studio, with costumes for kids to get dressed in and then dance in front of a green screen for chroma keying in different backgrounds. There were various moulding stations using sticky foam beads, and a play area with giant foam blocks and tubes for constructing things, and a game area with giant checkers and connect-4 and so on. One cool thing was an interactive game area, with electrical contacts in the floor, which the players had to connect with their bodies or foil-wrapped props to complete circuits and score points. There was also a robotics lab, with programmable plastic robots which could presumably move around and do things to interact with their environment, but I didn’t have time to explore that. After looking around at everything, I went out to the museum shop, which had a 30% off closing sale. I found some cool comic sketch books, with pre-drawn panels, and since they were cheap bought two of them. 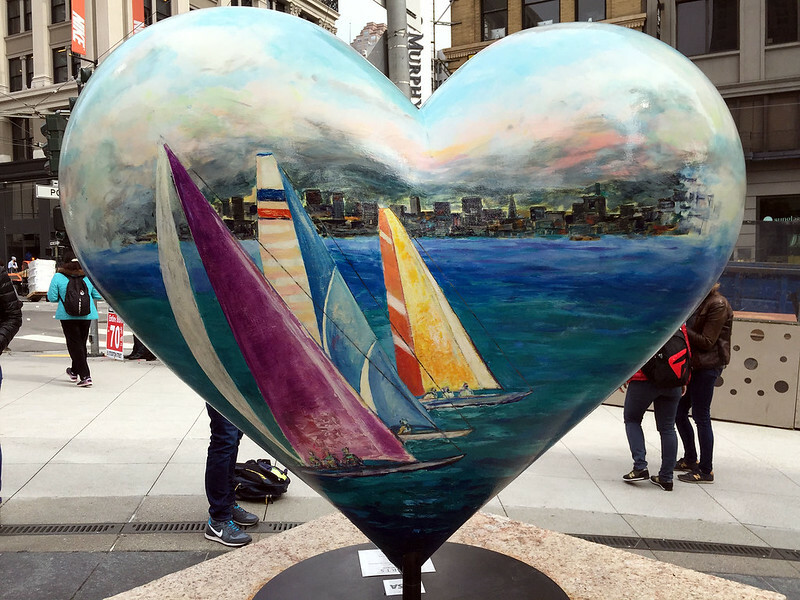 Painted heart of San Francisco, Union Square. I walked back to the hotel, where I had a shower and packed my bags for the flight. I checked out and left the luggage at the hotel, then went out walking again. I walked down to Market Street and then along it to the Ferry Building. The weekend market was set up on the other side of the Embarcadero, and I had a quick look at the stalls, before heading into the Ferry Building. 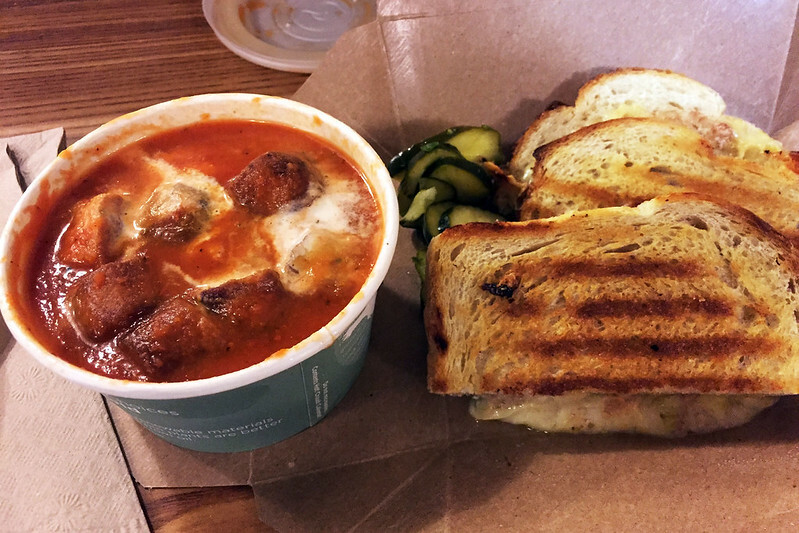 Grilled cheese and tomato soup, from Cowgirl Creamery. It was about 13:00, so I got lunch at the Cowgirl Creamery, getting their grilled cheese sandwich of the day, and a tomato soup to go with it. They rotate the cheeses they use in the sandwich every day, and today it was a combination which included some plum jam, raclette, ricotta, and fiore sardo cheeses, which overall had a slightly blue cheese taste to it. It was really good, and combined with the soup was a great lunch. Then I had to try the Humphry Slocombe ice cream from the nearby stall. One flavour was the enigmatically named POG sorbet, which I had to ask about. 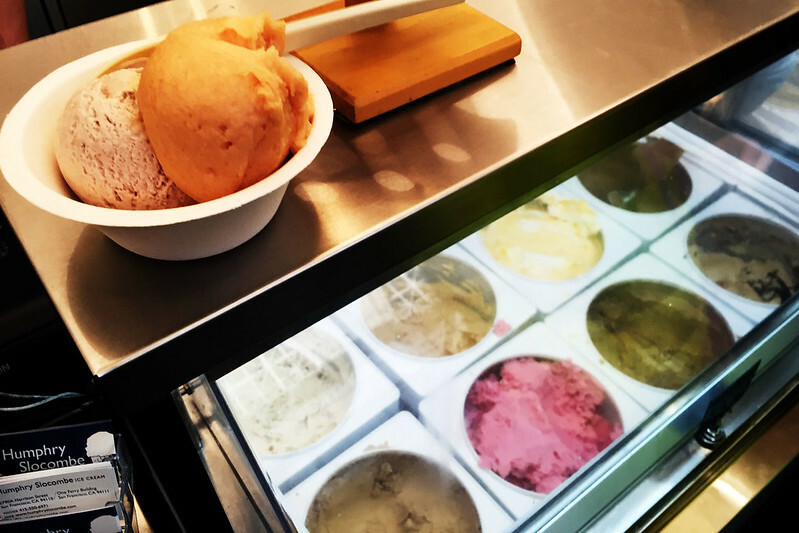 It was passionfruit, orange, and guava, which sounded so good that I chose that, and combined it with a scoop of poached pear. Both were really good, with nice strong fruity flavours. I walked back to the hotel to pick up my bags, making a stop at Macy’s to use the free WiFi for a bit first. Then I had to make the trek back to the airport, walking down to the Powell Street BART station, where I’d just missed a train and had to wait nearly 20 minutes for the next one. 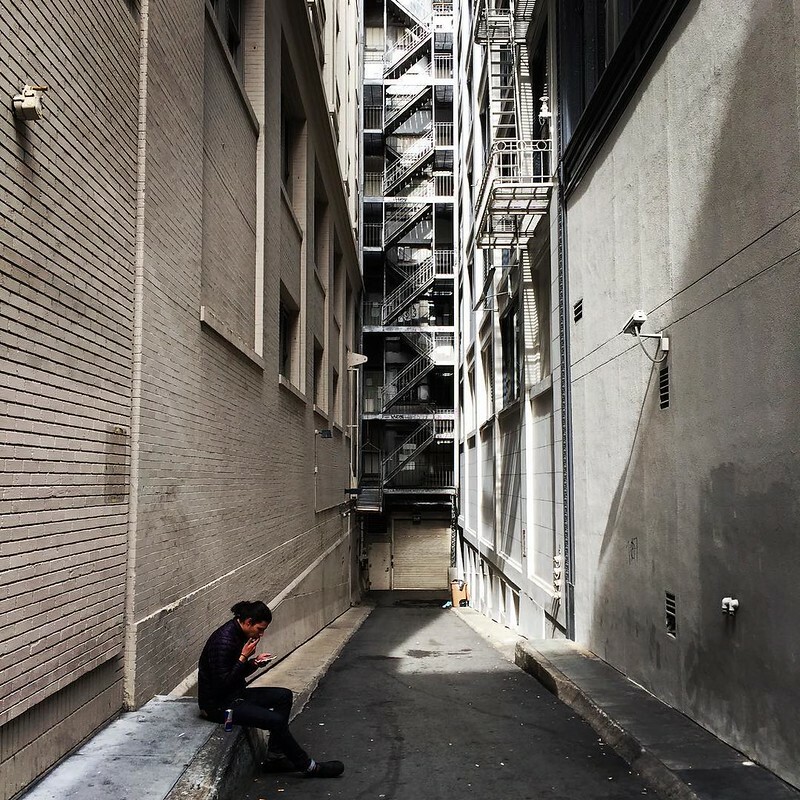 An alley of San Francisco. At the airport, I checked in at the self service counter and went straight through immigration and security to the gates area. There was a delay in security, as one of the baggage x-ray machines stopped working, and everyone in the queue who already had their stuff in trays had to move them all over to another machine. But I got through and then relaxed a bit in a bar, trying a Sierra pale ale and typing up this diary, before heading to the gate to board my flight to Tokyo. This entry was posted on Sunday, 3 April, 2016 at 20:06	and is filed under Diary. You can follow any responses to this entry through the RSS 2.0 feed. You can skip to the end and leave a response. Pinging is currently not allowed.